Believe it or not, there actually are enough hours in the day, we just don’t always spend them productively enough. Life seems to keep getting busier and we are trying to do more, achieve more, fit more in and be something to everyone. No matter how busy you are, take some time back for yourself to ensure you are keeping fit, healthy and active. You will never have this moment again so do it now! It wasn’t too long ago that I was always waiting for the ‘right time’ to start living a fit and healthy lifestyle. What I didn’t realise was that life was passing me by anyway and there really is no such thing as the right time. I realised it was now or never. We are always justifying how busy we are as if we are looking for some kind of medal. It’s become a social status and if someone asks how we are, we automatically reply with a sigh and an “I’m so busy”. Well, busy or not, one thing is certain, life won’t stand still or stop being busy to wait for you to get moving and make time for your health. So, right now seems like the perfect time to start. Stop waiting and just commit to making 2018 your year to make it happen. It’s not as hard as you think, fitting exercise into your everyday life, you just need to prioritise and plan. I am positive that you can find a minimum of 15 minutes a day and even more on some days. Even on the days where you think it is going to be hard to fit it in, look for opportunities and try your best to make it happen… these are usually the days you need it the most and will benefit greatly from some exercise. And if it doesn’t eventuate, don’t beat yourself up over it ~ tomorrow is a new day with new opportunity. My number one tip is to wear your workout gear, wherever and whenever possible! You will be surprised how much more inclined you will be to workout, get moving and be more active in general. This really does increase your activity levels. Don’t be afraid or embarrassed about being one of ‘those’ women who do everything in their activewear… embrace it and be proud, it’s a way of life! If you are extremely time poor and can’t make it to a gym, make High Intensity Interval Training (HIIT) sessions your best friend. A 10 – 15 minute HIIT session in the comfort of your own home before work, while the baby sleeps, while the load of washing is on, after the kids are in bed or whenever else you can grab some time will make you feel so energized, get your heart rate up, burn fat and release those endorphins. Another great time to fit in a little workout is while playing with the kids. Involve them and make them part of the workout, they will love it and you are role modelling wonderful lifestyle behaviours that they will hopefully adopt as part of their lives as they grow up. Jog on the spot, squats, pushups, plank, burpees, have a running race, skipping competition, dance, the list goes on. They are all simple body weight exercises that do not require any equipment and the whole family can do it together. Use the kids as weights, let them time the sets and count the repetitions. They just love being a part of what you are doing. Just make it fun and you won’t even know you are working out and you will be also spending quality (technology free) time with your children…. A rarity in itself these days! Make an effort to do an outdoor activity on the weekend (rain, hail or shine – just dress appropriately…. Weather really shouldn’t be an excuse not to exercise). Being outdoors is great for boosting your energy, relieving stress and blowing off those cobwebs, especially if you are stuck indoors or behind a desk all week. Go for a walk, hike, jog, bike ride, walking tour, or just park your car further away from where you need to be and walk – let’s stop being so lazy or in a hurry all the time. We are all guilty of it. One of the best ways I have found to increase my activity and exercise during the week (particularly incidental exercise) is by using an activity tracker/fitness watch. I love my Garmin 235. If you are someone who is motivated by challenge and hitting a certain target and goal then I suggest you get yourself a tracker (one that has an app on your phone is great for easy viewing of your progress and integration into your daily life). My goal at the start of last year was to get better at running and make running a consistent part of my life. The last little tip I have is one I found extremely beneficial for increasing my exercise, in particular my running when I was just starting out, during a busy week. Whenever we went somewhere as a family (eg. Grocery shopping, visiting family, sport etc), I always dress in my running gear or at least have it in the car along with a hat, suncream and earphones if you like to run with music – (be prepared and you can’t go wrong) and then on the way home I would get Hubby to drop me off and I would run the rest of the way home. Make sure you pick a distance you know you can comfortably run when you start out and you can increase it each time. I’ve actually lost count of the number of times I have done this and it gets it out of the way without having to make specific time during the day or stop what you are doing to leave the house to go out for a run. It’s a no brainer and it helped my running in the early days immensely. Often the family will follow me in the car for a bit and yell encouragement out the window and then they go and park somewhere further along and surprise me. It helps keep you going when it gets tough or you want to stop. So, there are plenty of ways you can fit exercise and activity into your busy week. It’s not about having time, it’s about making time! Set your goals, plan your week and just get it done. No questions, no excuses! Follow me over at https://www.facebook.com/fitm.u.msa for workouts, tips, motivation, recipes and more. It’s a great community and we would love to have you join us. 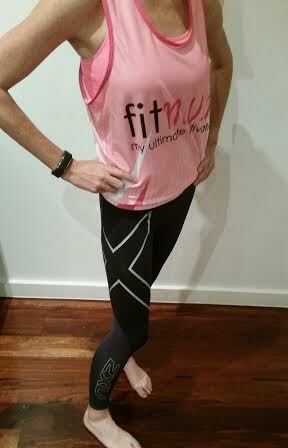 I was stoked when the second product I received from the amazing RunStopShop (www.runstopshop.com.au) was a pair of 2XU Elite Compression Tights. As I have gotten into my running in the last year and I am training for my first half marathon in August, I knew I wanted a pair of compression tights for my winter running. I’m a bit of a wuss when it comes to the cold weather so I was more than happy to give these babies a whirl…. anything to help me not give up my running training through the cold winter months. Just like my Polar Loop Activity Tracker, I started using the 2XU tights straight away. I went for a 10km run the day after I received them and I’ve got to say they felt great, kept me warm (but not ridiculously overheated… just right!) and they really made a big difference to recovery and how my muscles felt after the run. I must admit I thought they might be quite restrictive or too tight to run in as I usually only run in 3/4 active wear tights or shorts but they are probably the most comfortable pair of tights I own and I wear them all the time. The foot hole is small and they are tight (obvioulsy… that’s the whole point) to put on but it doesn’t take too long at all to get them on like I’ve heard others can. They are extremely supportive and hold you in, in all the right places. The reflective strips are great for early morning or evening running especially now that the nights are much darker, much earlier. 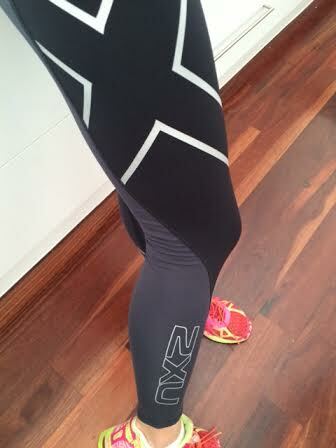 So, I am a mega 2XU compression convert and will be purchasing a second pair very soon. If you are in the market for a pair of running/workout compression tights then I strongly recommend you do yourself and your legs a big favour and try these. They look great and feel amazing. My muscles are thanking me and I am not pulling up sore after longer distance runs!! BONUS.